This article is an excerpt from an interview with Mr Ellis Webb of Royal Wootton Bassett. The audio interview relating to this story follows the article. Reginald and Win were siblings of Ellis’ father. Reginald Webb joined up in 1914, he was working in the railway works. He joined the Wiltshires – the 6th [Batallion] Wilts, that did go off to Galipoli. But for some reason, (which it doesn’t say), it just says on his testimonial that he was released – ‘not suitable for army service’. He then went and joined the Royal Field Artillary, but when, I’m not certain because his records don’t exist… All I know is that he was a driver – which meant horse driver, no doubt about that – and he went to Mesoptamia, and he suffered for the rest of his life from malaria, quite badly at times I believe. He worked in the railway works but the doctors there said that he should get out, and he went [in]to farming. At that time Wiltshire County Council owned or bought quite a lot of land around Wroughten, and he went farming there. But it was only about ten acres, so they only had about five cows and couldn’t make a living – so he went back on the railway but worked outside there, until he could get a larger farm – and him and his wife took up farming for the rest of their lives. In fact, their two sons, two of their sons that are still alive, are farming today; one down at Cleverton where they’ve been there since 1937, and the other one farms at Lyneham who’s been up there since 1955 or 56 time, they moved to Lyneham. So they’ve been involved within farming and his grandsons are now taking over the farms, but they’re still in the farming side of the family. The other sister, Win, she married Bill Dunsby, who was a tailor from Malmesbury. He had some Tailoring business. But, the funny thing is, although he was married and had 3 children, he obviously put down that his ‘next of kin’ was his father and his late mother. Why he didn’t put his wife down, I’m not quite certain. Anyway – he died of… well, it says in the original ones [documents] ‘accidentally killed’. They were building an ammunition depot, just outside Calais. In fact, that’s where he’s buried – in Calais. The wall collapsed, or something happened to him. He was with the 12th Labour Batallion, The Royal Berkshire Regiment. Well that’s what it says… but I have a letter from a man from the Berkshire Regiment, saying he was reported dying of wounds caused acidentally on the 31/08/16, and buried at Calais. 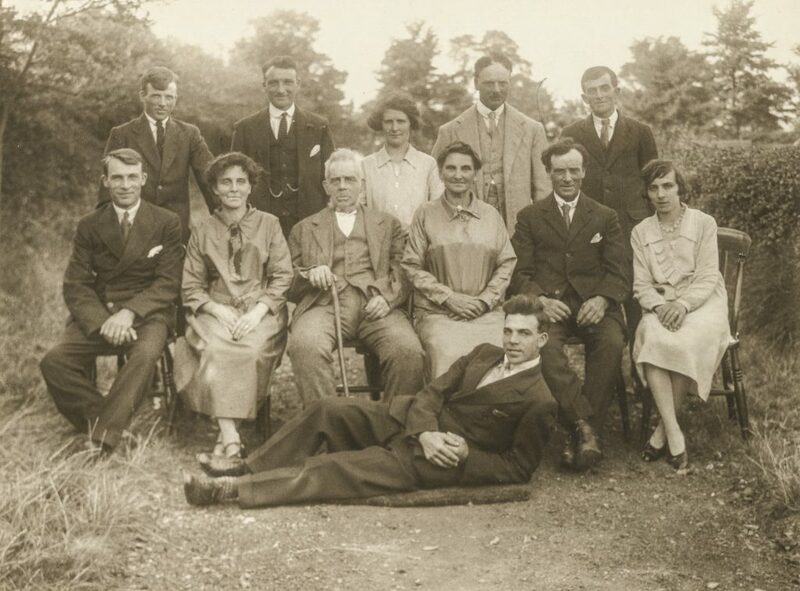 A larger family photo from the 1928 Golden Wedding Anniversary of Susan and James Webb. Reginald is standing 6th from the right on the back row, and Win is standing 2nd from the left on the back row. Aunt Olive and her husband Jack are standing 2nd & 3rd from the right, (back row). 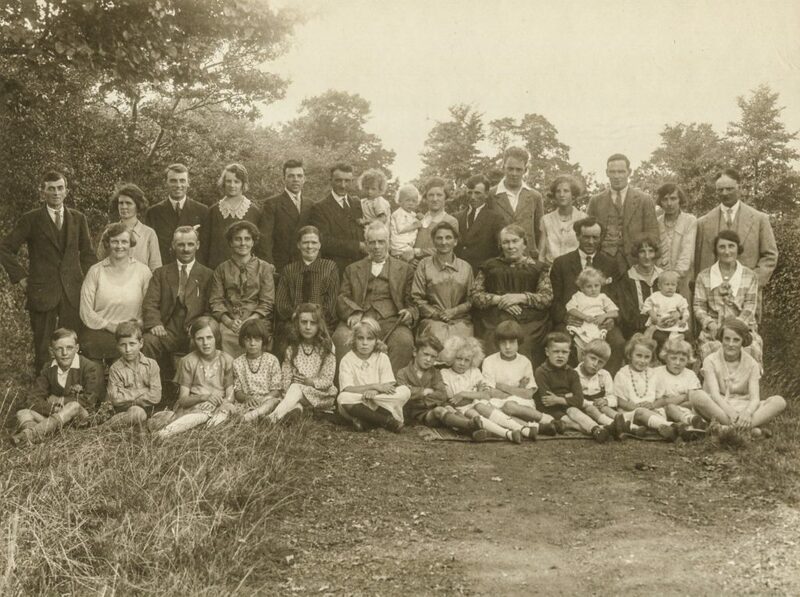 The child sitting at the far left of the front row is Ellis’ cousin Eric, who was sadly killed whilst serving with the Royal Navy aboard H.M.S Trinidad in 1942. Ellis during his National Service with the Royal Artillery in 1957. Ellis is standing fourth from the left in the back row. His brother is seated fourth from the left in the front row. Wonderful story, photo, and interview! Thanks for sharing.